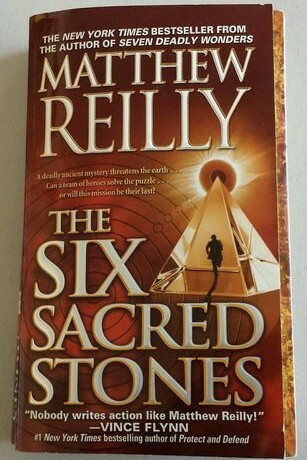 I have not read Matthew Reilly in awhile….sooo many books, sooo little time, but, when I do, I know that I need to take a deep breath, strap myself to my seat, and enjoy a 100 mph thrill-ride of a thriller. “The Six Sacred Stones” follows Jack West Jr. and his team on a new quest shortly after their last adventure: “Seven Ancient Wonders”. Now, the dark sun is threatening to end life on earth, and Jack and company set out to save us. But to do so, they not only have to find the six sacred stones, six crystal pillars, and the locations on earth where they can be put to good use, but, they also have to fight off enemies from ALL sides. If you like pure non-stop, seat of your pants, action in a book….you will love it too! Matthew Riley must be the only author who breaks a sweat writing….whew.